For the village in Iran, see Ashnan, Iran. Ashnan was the goddess of grain in Mesopotamia. 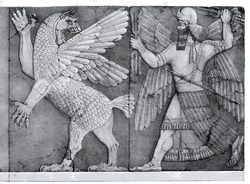 She and her brother Lahar, both children of Enlil, were created by the gods to provide the Annunaki with food, but when the heavenly creatures were found unable to make use of their products, humankind was created to provide an outlet for their services. ^ Samuel Noah Kramer (1964). The Sumerians: their history, culture and character. University of Chicago Press. pp. 220–. ISBN 978-0-226-45238-8. Retrieved 23 May 2011. This page was last edited on 29 October 2016, at 18:35 (UTC).